In a desert world of sandstorms and sand-wolves, a teen girl must defy the gods to save her tribe in this mystical, atmospheric tale from the author of Drink, Slay, Love.Liyana has trained her entire life to be the vessel of a goddess. The goddess will inhabit Liyana’s body and use magic to bring rain to the desert. But Liyana’s goddess never comes. Abandoned by her angry tribe, Liyana expects to die in the desert. Until a boy walks out of the dust in search of her. Korbyn is a god inside his vessel, and a trickster god at that. He tells Liyana that five other gods are missing, and they set off across the desert in search of the other vessels. For the desert tribes cannot survive without the magic of their gods. But the journey is dangerous, even with a god’s help. And not everyone is willing to believe the trickster god’s tale. The closer she grows to Korbyn, the less Liyana wants to disappear to make way for her goddess. But she has no choice: She must die for her tribe to live. Unless a trickster god can help her to trick fate—or a human girl can muster some magic of her own. "The sun and the stars will be jealous of me." Others looked ahead. She never had. She'd known her fate. But now... her future was as empty and terrifying as the desert that stretched around her in all directions. "Oh yes. Almost all deities pee themselves at least once in the middle of performing a miracle." 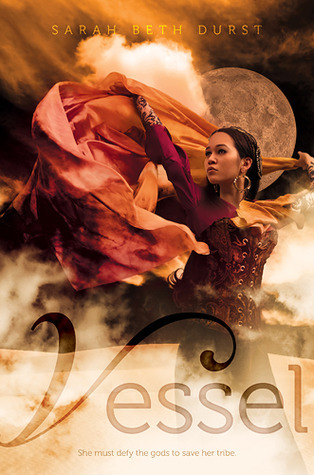 Gorgeously imagined world with rich and flavourful cultural tapestry, characters you will root for, a seemingly impossible quest of epic proportions, and a conclusion that will leave you breathless and heartbroken - Vessel has all that and more! This sweeping tale mixes adventure, romance, drama and enough eye-popping sorcery to earn this book a place on every fantasy fan's shelf. It's definitely one of 2012 must-reads! Once every hundred years, the goddess of the Goat Clan (Bayla) is summoned from the dreaming to ensure that her clan survives the next century. Her soul fills a human body - a vessel - to work the magic that brings rain to the dessert, increase the herds and make the oasis green again. Without the help of her magic, people wouldn't be able to survive in the ruthless, desolate desert that is their homeland. For centuries, people of the dessert have been summoning gods and goddesses and for centuries they've been following the same sacred ritual: the dreamwalk would chose the vessel for the goddess, preparations would be made and, finally, the ceremony would take place during which the goddess would take over the vessel's body, killing the vessel's soul in the process. Chosen to be Bayla's vessel, Liyana is ready for her sacrifice. For years she's been training in preparations for this moment. The goddess does not come, though, and Liyana - accused of being unworthy of the deity - is abandoned by her clan and left to die alone in the dessert. Heartbroken and desperate, she is found by Korbyn (a trickster god inside of his vessel), who tells her that her goddess did not, in fact, abandon her, but was captured and imprisoned. And five other gods shared her fate. To free them, she'll have to join Korbyn and the other vessels on their dangerous journey across the desert. A journey both physical and spiritual, that will make Liyana question her readiness to give up her life. Vessel is slow-going (and it's a good thing! ), reflective, emotionally engaging and visually stunning. It invites you to ponder issues such as sacrifice, putting the well-being of a group over the individual, and - most importantly - the meaning and importance of faith and free will. It's also a fascinating examination of a deeply religious society, its priorities, social structures and behavioural patterns. It's a meaningful and multi-layered book, but also one that is charming, entertaining and simply very enjoyable to read. I can't say that I devoured it in one sitting, but I loved coming back to it, slowly savouring every scene and dialogue. With her magical, evocative writing style and intelligent observations about life, love and family, Sarah Beth Durst captivates the reader and draws them in. Her prose is honest and convincing, but also very elegant and fairy-tale like. Dreamy and mesmerizing. The characters, as well as the settings, are gorgeously fleshed out and authentic. You can almost hear the hypnotizing rhythm of the drumbeats, feel the scorching sun on your skin, and smell the exotic spices. It's almost too easy to lose yourself in this world. Liyana is an absolutely fascinating character. Torn between duty and desire to live, she carries the weight of the tribe on her fragile shoulders. She knows what is expected of her and - while she's not overly enthusiastic about it - she has accepted her fate with remarkable grace and courage. She doesn't want to die, but she puts her family and her tribe before herself and therefore she's willing to give up her own happiness to ensure their well-being. Giving, caring and thoughtful, she's a wonderful and inspiring character. I absolutely adored her. As she gets closer to Korbyn, she begins to realize that she doesn't want to die. Her conflicting feelings are tormenting her, and the inevitability of her death weighs heavy on the reader's heart. I found myself emotionally invested in her story, cheering for her and hoping - against all odds - for a happy ending to her journey. Overall, this book is about mythology mixed in with religious beliefs, shaman magic and deities, but it's also - perhaps even most of all - about one girl who sacrificed everything - her life, her dreams, her future - for her family and tribe. It's about faith, love, dedication, honor, hope, persistence and making one's own fate. It's about fighting for the things worth fighting for and never giving up. It's a beautiful, thought-provoking and enthralling story and, while I'm very satisfied with the ending, I am also totally heartbroken to say goodbye to all the amazing characters. I absolutely loved Vessel. Fans of fantasy and epic adventures won't be disappointed! I will have to check this one out immediately! I've been so impressed with fantasy books this year and this one sounds totally epic. Great review! This sounds oo unique and awesome!!!!!! I was reading your review with so much enthusiasm and now I'm super excited for this book!!! WOOT! Yay! I am so glad you loved Vessel. I am seriously in love with the cover. It is gorgeous. And I am excited about the book now. Even more so now. Thankfully a copy is on hold at my local library, so I won't have to wait too long to be able to get my hands on it! WOohoo! Wonderful review! I really want to read this one now, it sounds amazing! Love the cover! I'm a bit impatient to slow-paced books but as you said, it's a good thing for this book so I might give it a try. Okay so I commented on your review on Amazon when you posted it and I wanted to pick this up then.... Still haven't but seeing the review again rekindles my need too <3 GREAT REVIEW! Woah! This sounds fantastic. And so, so, amazing, with the element of (perhaps) forbidden love. I need to pick this up soon!